Despite having a case of the icks, I was well enough to knit. Which has me thinking should I really complain? Now here is the problem, working on a test knit with a fast approaching deadline has me not being able to work on things that I want to work on, which is everything but the test knit. Don't get me wrong, the test knit is a wonderful knit and the yarn incredible to work with. It is just that the stubborn knitter in me wants to knit everything except for what I should be. The point I am crawling towards is that I need inspiration in order to stay focused on the test knit. Keeping me company and away from all the pretty yarns has come from a number of different areas. Podcasts (my watch lists are ever changing depending on my mood). Now this may sound off but considering that the test knit I am working on uses organic wool, my choice is podcasts follows along that inspiration. Is that odd? Then are the television shows. 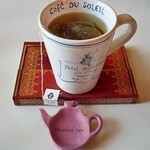 These too are determined on what helps me to focus on my wooly intention. Vikings (odd choice I know but within the blood and fighting there are glimpses of weaving and beautiful wools). Then we have beautiful Instagram feeds, because for me seeing beautiful wools and knits in action ignites inspiration. I adore, Indie Feed Music. So the question of today, how do you keep yourself focused on a monogamous knit? I know there are many of you out there that have no issues avoiding the temptations that haunt non-monogamous knitters like me, but how about those of you who tend to feel the itch of knitting all the things? Enjoy a song and we will chat again next Sunday. Despite the knitting frenzy some of us are in, this time of year is our year. 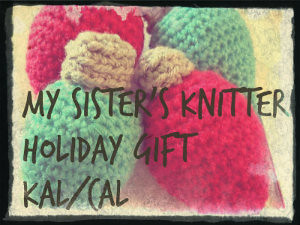 Our year to create, knit or crochet, plan, and gift. 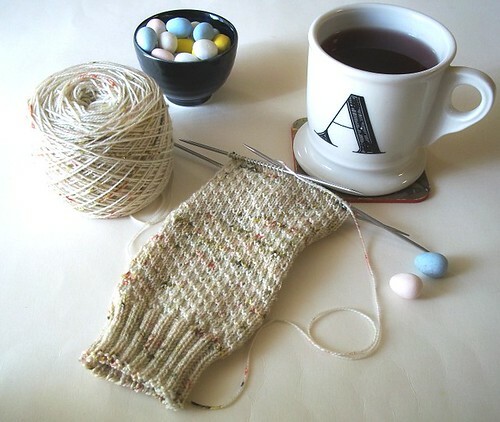 Warm pumpkin tea is being sipped while gifts are being knit. Listening to Christmas songs, during the completion of a comfort blanket for a friend in need. Thanks to the many amazing women in our group, I am feeling the love with every square connection. New sock yarn is being ignored (with great difficulty), while priority knitting is taking priority. Our Ravelry group has helped to to make this holiday season that much more. Inspiration and talent is in abundance here my friends. :) Twenty nine projects have been finished in two weeks! Podcasts are being watched here and here, to help me keep in the knitting spirit. Ornaments drooled over at Liesl's. Favorite holiday movies are in heavy rotation, again helping with the knitting process. Since I need to get back on track with the knitting frenzy, I will leave you with my favorite Christmas song. Even with a case of startitis, things are coming off the needles. Came as a surprise to me as well. These are my Simple Skyp socks, which I named Sir Isaac Lime. That is my favorite flavor of Otter Pops. The yarn is Socks that Rock light weight in Lemongrass. This was my first time using STR and I fear I want to knit many more socks with this fabulous yarn. It is wicked Squooshy! In celebration of casting off a pair off socks, it seemed only right that another jumped on the needles. 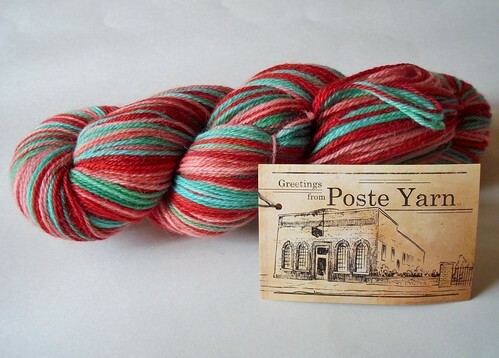 Of course the yarn is bright and stripey, it is what I have been craving lately. And I am not the only one, Claudia and I have been having fun enabling each other with new shops carrying self-striping yarn. Sorry for the blurry pic. My camera was not liking all that color explosion. I will brag more about this yarn next week. How about some loves? Feels like a while since I have shared some. I am sure it hasn't been that long, but it feels like it. First salad that I can't get enough of. Just a simple tomato, cucumber,red onion,feta and balsamic vinegar salad. I can eats buckets full and I do! Now how about some loves from blogland..let's go! Oh my gosh Becky, take a look at her shawl. Jody...wow. Are you drooling right now, because I am. Sam's scarf has me thinking I need to make one of these. I have been waiting excitedly for each new posting of Robin's crazy quilt's stitches. Seriously, scroll down and you will see each fantastic one. Robin has become a dear friend, we share a love for Colorado where she lives and where I grew up. She posted an excerpt of a letter she sent to her brother about the devastation our lovely state is experiencing. It makes me cry. I will be casting on this lovely hat, which is modeled by the even lovelier Andrea. The Ishbel pattern never seems to go out of style. Everyone has knit one and some many. I on the other hand none. After seeing Cassy's (great blog name! ), I feel destined to add it to my ever growing list. There you go. Bet you fell in love at least once with all those beauties. I am off to do some knitting and preparing to cry after watching this movie tonight. Hope you are all safe, sound and happy! What a wonderful weekend for knitting. Our weather here in Arizona has been up and down lately, we went from 85 on Friday to 58 today. Truth be told I really live in the wrong state because I would be the happiest woman alive if it would stay at 58. In the spirit of the cooler temps, the WIPs have been progressing. Here is my WIP basket. In your face!!! Heh- didn't mean for the picture to be so "in your face" but it is and there is no going back. Because soon after the pic was taken, WIPs were taken out and being working on. My swap socks are coming along. Now I love a challenging pattern, but I am about done with left twists and right twists. Hedgerows have been getting some work done as well this weekend. While the pattern is a tad boring, they are a nice break from the left and right twists of my swap socks. Ah, and look who else came out to play this weekend. She was a bit pissed at me for letting her languish so long in the WIP basket, but all was well again after I knit quite a few rows during movie watching. Sock scraps have been worked into little grannies. Not really into the hexipuff craze, so I figured why not have little grannys for whenever the mood strikes. From the looks of it, you would have thought that I never left the house. I did if only for a quick trip for some lovely spring flowers and cookies! Be warned really good cookies that come in a bucket are never a good thing when you live alone. Hmm...why does my stomach hurt? I mentioned movie watching while I worked on my shawl. I watched the movie The Beginners. How is it I forget how much of a crush I have on Ewan till I see him in a new flick? Other than Ewan being wicked cute, this movie was really good. I also watched One Day, man was I on a cute guys weekend watching thing or what? Maybe it was a hot guys with accents thing. As if I haven't overlaoded you with enough images for one post, look what just happened outside! A wee bit of hail. It happened for only 20 seconds and now it is already melted-boo. Now that I have talked your ears off, I will let you get on with your knitting/crocheting and I will get on with mine. 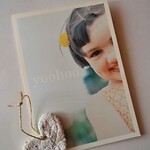 See you back here in a couple of days for a giveaway-whoot whoot! At one time or another, many of us go through that period in our knitting life where we decide that our WIPs need to be thinned out. Sometimes there are projects that we know we will never work on again. Other times there are projects that for one reason or another, fell off our radar. As I was reviewing my obsese pile of WIPs, I came across my Miters. I am not sure if my heart wasn't it in it or what, but what faced me was 7 squares that were uneven and crappy. Maybe I thought I could bulldoze through these and somehow end up with a fabulous blanket. 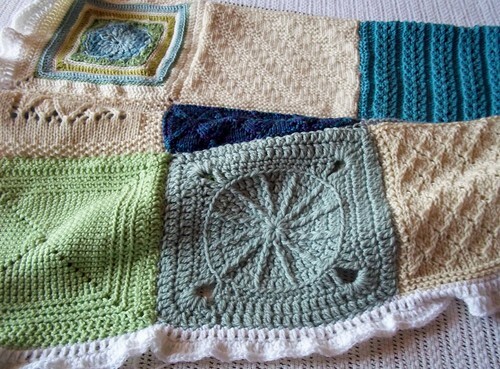 Instead I would have ended up with a blanket that I would have been ashamed to show anyone, due to all the mistakes. I made a decision. I ripped back quite a bit. I now approached these with the intention of crafting something I would be proud of and that was worthy of my time. My seven squares quickly went down to two, but I could not be happier. I am enjoying the rhythm that comes from the garter stitch. Much needed since I have been feeling a bit under the weather in the last couple of days. So, I have been watching Lord of The Rings (yes,again) , drinking lots of fluids, and all seems right again in my knitting world. How is everything in your crafting world? I have stuff going on, believe me. The KAL with Ruth, is in full progress. I am way behind her. She is also usuing her own handspun yarn,fabulous! The girl is flyin'! The pattern is Multnomah by Kate Elsa. The beautiful yarn is Wollmeise in Fratello that I won from Nova's birthday giveaway. 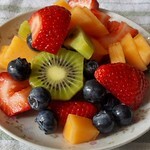 I am using size 3 HiyaHiya circulars, (HiyaHiya is my favorite). I was waiting for the perfect pattern that would show off the beautiful shades of this yarn. I think I found it. 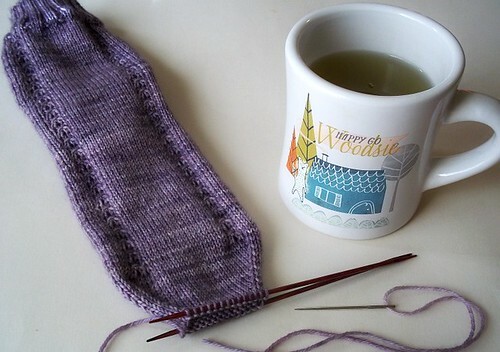 While the shawl is being worked on, I am also working on socks. Yes, I am switching back and forth between projects. 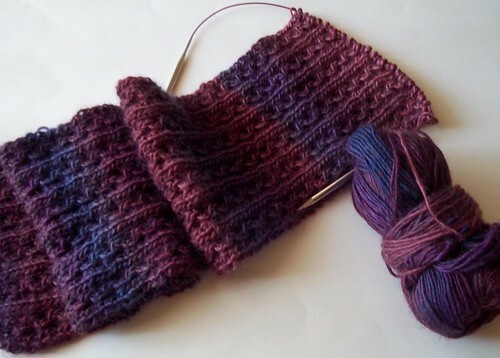 Ruth's super purple socks are almost to the heel flap. The purples and blues in the yarn are just insane, almost iridescent. They are so her! My Port Ludlow socks, have their heel and now I am decreasing for the foot. The pattern, the yarn, love everything about these. My photo does not even come close to doing the colors in this yarn justice. It is indeed a far cry from my normal shades, goes to show you how many you love when you just try them. Working on three projects may sound stressful, normally it would be. I have decided to take a different approach and I find it to be working for me. I am just enjoying the process of creating. I am not worrying about deadlines, I am just going with the flow. Ironically things seems to get accomplished more if I think in those terms. An inspiring movie or show always helps too. Instead of watching the movies, I watch the Appendices. I have always been interested in watching others creative process, it motivates me. It is awe-inspiring to watch how someone can create a huge statue out of foam and make it look realistic. The craftsmanship and details that went into this trilogy are just insane! What motivates you to create? Is there a process, a location, or a movie that aides you in your crafting? I did not meet my own deadline. Excuses, none other than I felt a bit all over the place this week. So progress is below and it is nothing to write home about. What has me all over the place? Inspiration. Heaps of it. I want to start everything (but I am not). Instead I have been stalking blogs and watching others finish things. I would blame it on the rain, except I live in Arizona and Milli Vanilli already used that excuse. Maybe I will blame it on Bethany and her Sunday Stimulation videos. I found this on Youtube, it is simply wonderful. This got me thinking of some of my favorite memories. Holding my grandmother's hand. She has a lot of grand-kids but somehow when you were with her she made you feel like her favorite. She loved Elvis, I would sit and watch Elvis movies with her and she would always hold your hand. No matter how old you were. My first kiss. Growing up I had two friends that were fraternal twins. I used to have a crush on one of them. He was an artist, so somehow at age 7 I lured him under my bed to draw (don't ask me why or how), and I planted one on him. More or less attacking the poor guy. Getting a Strawberry Sizzler Huffy Bike for Christmas.It was hot pink with strawberries on the banana seat and had wonderful pink and silver streamers that hung from the handle bars. Coming to the realization of just how special my mom is. One day I was watching her interact with a sales clerk. I saw this clerk go from having a grumpy face to lighting up after talking to my mom for just a few minutes. My mother has a way of making everyone feel special just by knowing her. Seeing it through my adult eyes was magical. Experiencing New York City for the first time with the mom. I could go on and on, but I would love to hear one of your favorite memories. Ahhhh...it has been one of those Saturdays. Perfect combination of getting things done and enjoying the day. Did the weekend housecleaning last night, so that I could wake up today without worry. By taking care of that chore last night, it freed up my afternoon to catch a movie and lunch with the sister. The movie was even better than I had hoped. The sister had read the book and was really excited to see the movie. According to her the movie was a very good mirror of the book. I recommend it highly. Lunch was just as good as the movie. I took her to my favorite place for Buffalo Chicken Pizza. Normally I am not one for adding things other than what I consider the norm on pizza. For instance, I don't order salad pizzas or bbq chicken pizzas. So when a friend told me that BJ's has the best buffalo chicken pizza, I was hesitant. Well, after one bite and many visits later, I crave it like a mad woman. With an ice cold beer it is perfection! Now I warn you it isn't much to look at(a least in it 's leftover state), but wow. Want to know what else I am in love with, this fine Saturday? Everything she knits. The green tweed on the needles especially. Reading her week in a life. Something about her posts makes me feel peaceful. Can't explain. Admiring these bowls, as I imagine having the will to make some homemade oatmeal to fill them. Imaging myself making this, with my leftover sock yarn, yet knowing full well, I never will. Have you found any new loves this week? ***The scarf above is one of the many WIPsI have on the needles. I have been good about trying to focus on one WIP at time, but the color was just too scrumptious not to share. Yarn is Cascade Heritage Sock in Blood Orange and the pattern is the Checkerboard Lace Scarf. I feel for you all I really do. Temperatures are soaring for most and the humidity beyond miserable. Here in AZ we try to stay indoor and keep hydrated. Then there are those of us who like to defy the sun gods and bake our butts off when it reaches 103 and then some. Other than baking, I caught a movie this weekend and had some incredible Cajun food. I am working on finishing up knitting projects this weekend. So I won't bore you with more progress pics. Next weekend I should have some FO photos. If you are looking around blogland, you can check out some things that had my attention this weekend. I am completely smitten with this video podcast. A must for my coffee cup stash. Making a promise to myself that I will knit this lovely for myself in a charcoal gray this winter. Having a mad crush on a scarf and blog. 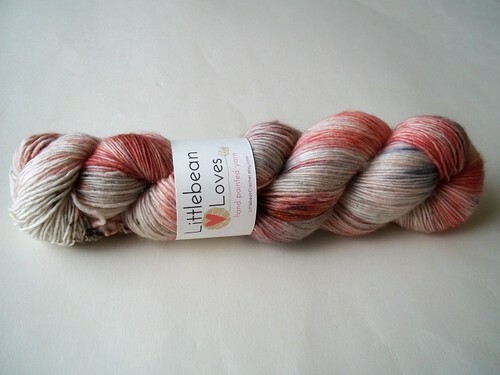 Decided that my August socks will be Mystery Sock KAL. Just thought I would check in and see how you all are fairing the heat. Hope you are all cool in your homes and knitting happily away or maybe you get some pointers from Marilyn on how to stay cool. Just a quick post to show off what has been on and off my needles this week. Quick because I seem to have gotten some type of stomach bug, that has just downright kicked my arse! So do you want to see what I crocheted for my baby? Then I cast on another hat for one of my Ravelry groups. This by far is one of my favorite hat patterns. It only took two nights. The yarn is Malabrigo Worsted-Cognac. Other than that, I have been sleeping alot and knitting on socks when I have been awake. Oh, and I told you in the previous post that the sister and I went to see Bridesmaids. It was hilarious. The sister and my face hurt from laughing after it was over. Melissa McCarthy (from t.v. show Mike and Molly), stole the show for us. I hope you all are having a fantastic summer weekend and able to get out and enjoy your weather. Most of us don't here in AZ, because it is too darn hot! :) Enjoy a song that I have been singing around the house at the top of my lungs. This is really scary considering I cannot sing at all.